Looking for the perfect comfort food in a bowl? 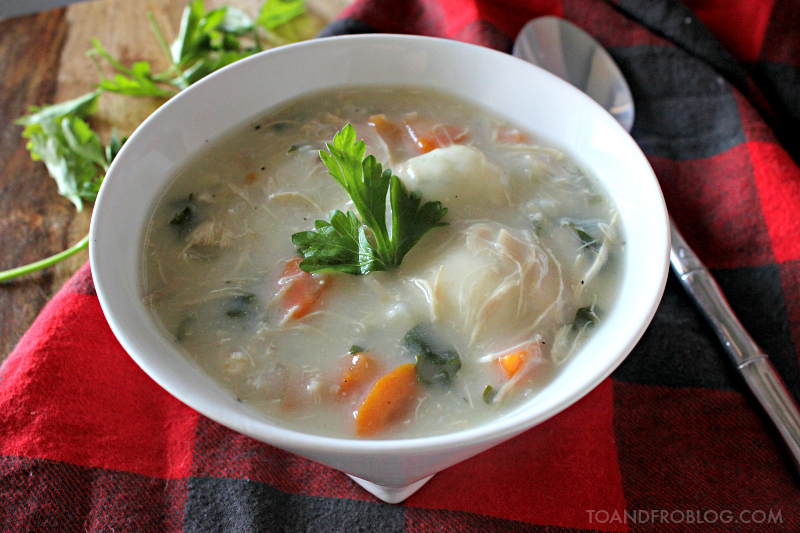 Check out this hearty recipe for the best Chicken Dumpling Soup, loaded with chicken, vegetables and tasty dumplings. I recently discovered cooking chicken in the slow cooker. I don't know why I wasn't cooking it this way before - boy, was I really missing out. And it's so easy! Just add two skin-on, bone-in chicken pieces (usually breast and thigh combos) to the slow cooker, season with a bit of salt and pepper and then cover with approximately 2 cups of water. I then allow it to cook on high for 3-4 hours, or until no longer pink, and voila! Delicious, juicy, tender, fall-off-the-bone chicken. Not only does it create tender, delicious chicken, you will also be left with a flavourful broth that can be used in your next recipe, or in this delicious soup recipe. During the cold months, soups are my go to. I usually pay them with a side salad or a sandwich. This soup, however, is a complete meal in a bowl. 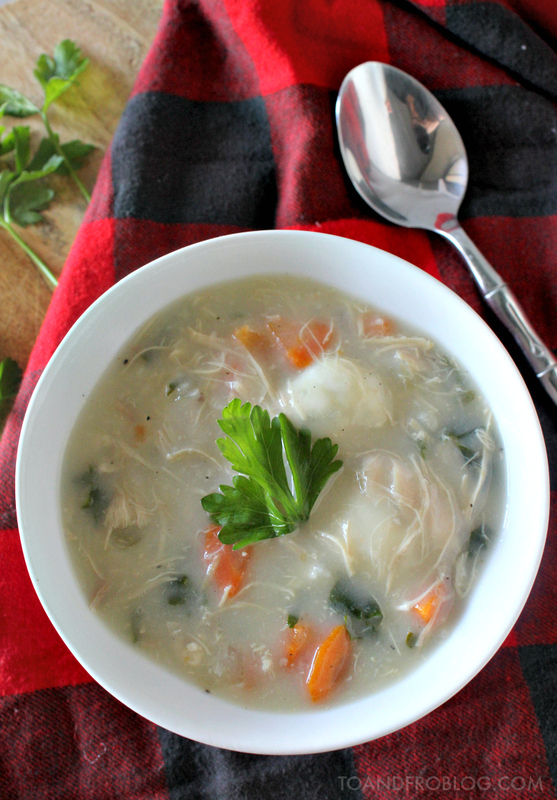 Loaded with that tender chicken, hearty vegetables and tasty dumplings, this Chicken Dumpling Soup is sure to win over your family's stomachs this chilly winter. Add the olive oil to a large stock pot and bring to a medium-high heat. Add celery, carrots, onion and garlic and sauté for 5-7 minutes, until onions are translucent. Add chicken pieces and garlic powder to the pot. Stir to combine. Add chicken stock and water to the pot. If you like your soup salty, feel free to use 8 cups of stock, instead of half water, half stock. Bring mixture to a simmer for 25-30 minutes. While soup is simmering, make your dumplings. In a medium bowl, whisk together dry ingredients. Stir in the melted butter, buttermilk and parsley until just combined. At this point, should be a nice dough. Set aside. Ladle 2 cups of the cooking liquid into a large bowl. Whisk in 1/2 cup of flour until smooth. Add flour mixture back into the soup by continuously whisking until combined. Simmer until slightly thickened, occasionally whisking, about 8-10 minutes. Once soup has thickened, add dumplings. Form balls of dough about the size of half of your thumb. Gently drop dumplings one at a time into simmering soup. Simmer, covered, until dumplings are firm, about 12-15 minutes. Serve immediately, sprinkled with additional minced fresh parsley for garnish (optional). Home Chef Tip 1: If you do not end up using all of the dumpling dough (I only used about half), store the remainder in the freezer in a freezer-safe container. It will keep for a few weeks. Home Chef Tip 2: If you do not want to cook the chicken from scratch, you can also use leftover chicken or turkey and premixed stock. Voila, comfort food at its finest! If you like this recipe, you may also like this recipe for Fall Harvest Root Vegetable Soup. What is your favourite soup recipe? Any fall or winter favourites? I'd love to hear!